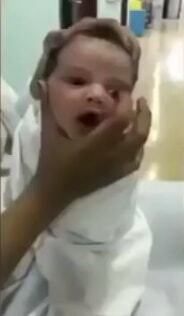 Three nurses caught on video squashing the head of a defenseless newborn baby at a maternity hospital in Taif Saudi Arabia have been fired after the video went viral on the social media. 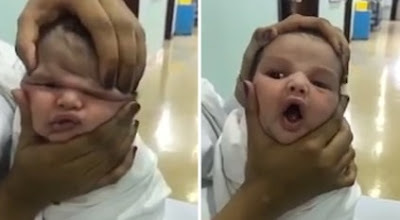 One of the unidentified healthcare professionals grabbed the baby by the neck and forehead and cruelly squashed the baby’s face as her two other colleagues giggle in the video sparking outrage on the social media. The nurses have been identified and fired. Taif Health Affairs office has also revoked their medical licenses. The spokesman for the ministry said the nurses have been banned from practising nursing in the country. 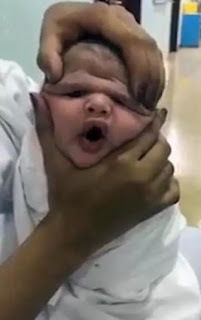 The father of the helpless infant who saw the video on the social media said the infant was in the hospital for 10 days for urinary tract infection treatment only to end up in the hands of the wicked nurses. Activists all over the world are now calling for jail term for the wicked nurses for torturing the helpless baby. Wonders, they say shall never end. What do we call the angelic facade of nurses? Corporate witches? I hope the poor child is still alive.